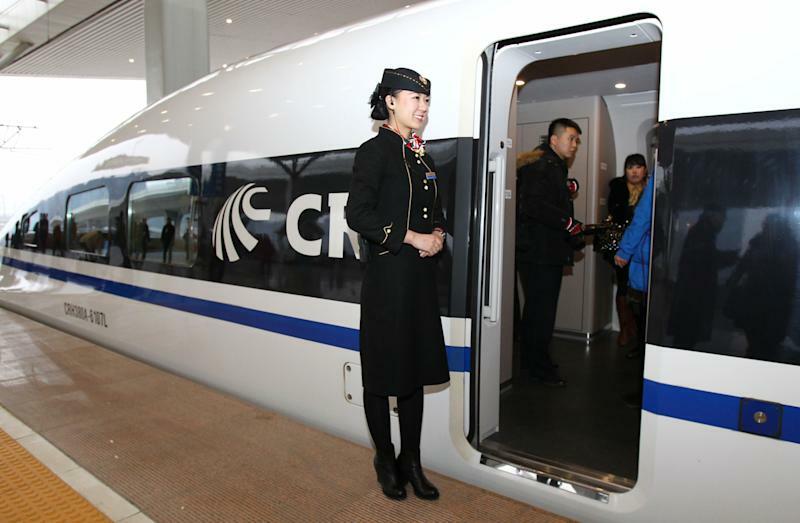 Beijing (AFP) - China and Russia are considering building a high-speed rail line thousands of kilometres from Moscow to Beijing that would cut the journey time from six days on the celebrated Trans-Siberian to two, Chinese media reported Friday. The project would cost more than $230 billion and be over 7,000 kilometres (4,350 miles) long, the Beijing Times reported -- more than three times the world's current longest high-speed line, from the Chinese capital to the southern city of Guangzhou. The railway would be a powerful physical symbol of the ties that bind Moscow and Beijing, whose political relationship has roots dating from the Soviet era and who often vote together on the UN Security Council. They have strengthened their relationship as Western criticism of Russian President Vladimir Putin mounts over Ukraine and other issues. The two signed a memorandum of understanding earlier this week during Premier Li Keqiang's visit to Moscow in which Beijing expressed interest in building a fast rail link between the Russian capital and Kazan in the oil-rich Tatarstan region, state broadcaster China Central Television reported. The 803-kilometre line would be the first stage of the route to Beijing, CCTV said. At present, trains between the two run along the Trans-Siberian railway that links Moscow and Vladivostok, before switching to a branch line heading south through the Mongolian capital Ulan Bator. Direct passenger trains between Beijing and Moscow went into operation in 1954 and there are still two services per week, CCTV said. The new link would cut the train travel time from six days at present to under two days, the Beijing Times quoted Wang Mengshu, a tunnel and railway expert at the Chinese Academy of Engineering, as saying. "If the funds are raised smoothly... the line can be completed in five years at the quickest," he added. The paper cited a research report that put the cost of one kilometre of Chinese-built fast rail at $33 million. The country has the world's largest high-speed rail network, built from scratch in less than a decade, relying on technology transfer from foreign companies, including France's Alstom, Germany's Siemens and Japan's Kawasaki Heavy Industries. Its reputation was tarnished after a bullet train collision in July 2011 near the eastern city of Wenzhou that killed at least 40 people and injured hundreds. But China is now keen to promote the export of its technology, and has been building high-speed rail networks in Turkey and Venezuela.